MENU' - Benvenuti su latrattoriacostantin! Risotto Costantin with sausage, radicchio salad and taleggio cheese. Sliced Beef with aromatic erbs. Mixed fried fish from Lake Como. 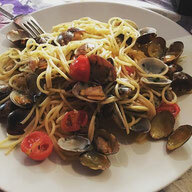 Spaghetti with fresh clams, cooked with garlic and chili pepper. "Calzone Liscio" - a close pizza with baked ham and mozzarella cheese.